Genetically modified goat milk containing higher levels of a human antimicrobial protein was effective in treating iarrhea in young pigs- a finding that displays a potential benefit of genetically modified organisms in promoting human digestive health. This was the first published study to show that goat milk with elevated levels of lysozyme, an antimicrobial protein found in human milk, can fight bacterial infections in the gut. Every year, 1.8 million children around the world die of diarrheal diseases, caused mainly by the bacteria E. coli. Millions more who survive are still left with physical and mental impairments. Though genetically modified organisms are still controversial, this study highlights their life-saving potential in the treatment of diarrhea. "Many developing parts of the world rely on livestock as a main source of food," said James Murray of the University of California, Davis, the lead researcher on the study, in a statement. The study was published in the journal PLOS One on March 13. "These results provide just one example that, through genetic engineering, we can provide agriculturally relevant animals with novel traits targeted at solving some of the health-related problems facing these developing communities." Lysozyme is key to the digestive health of breast-fed human infants, since it is a probiotic protein that promotes the growth of beneficial gut bacteria and inhibits the growth of bacteria that cause diarrhea and intestinal disease. The protein occurs in the tears, saliva, and milk of all mammals to different extents, but is produced in exceptionally high levels in human breast milk. Ruminant animals like goats and cows produce very little lysozyme, which make unmodified goat and cow milk poor substitutes for human breast milk. 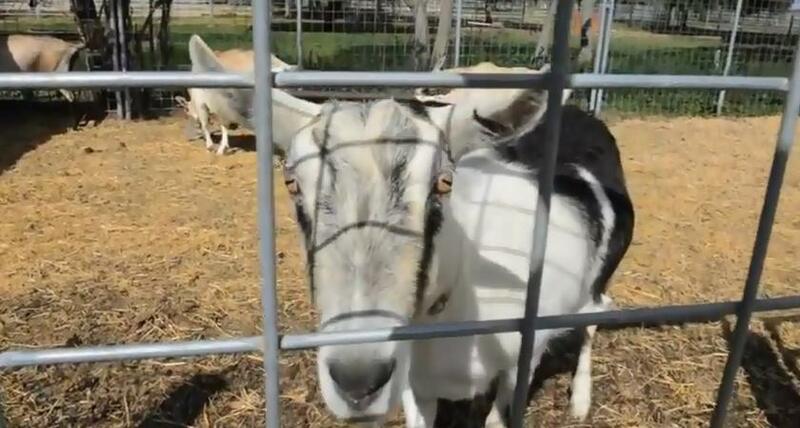 Murray and his team genetically modified goats so their milk would contain higher levels of lysozyme, in an effort to see if the modified milk would have similar diarrhea-fighting properties. Pigs have similar digestive systems as humans and already produce lysozyme in their milk, which made them ideal research subjects in lieu of humans. Half of the pigs in the study were given the genetically modified goat milk with higher lysozyme levels, while the other half was given milk from nontransgenic goats that had low lysozyme levels. The results shows that the pigs fed the genetically modified goat milk recovered much more quickly from diarrheal infections than the other pigs, and that they were less dehydrated, had less gut inflammation and intestinal damage, and regained their energy much faster after recovering from their bacterial illness. The researchers found no negative side affects from the genetically modified goat milk. Research suggests that goat milk is more easily digested by people who do not tolerate cow milk, since its proteins are shaped differently, and that it can help fight anemia and promote bone health. Murray hopes that the genetically modified goat milk's benefits for the pigs used in this study can apply to human children suffering from bacterial diarrhea as well, though it will likely take years before the transgenic milk can be studied sufficiently and approved as safe for human consumption.